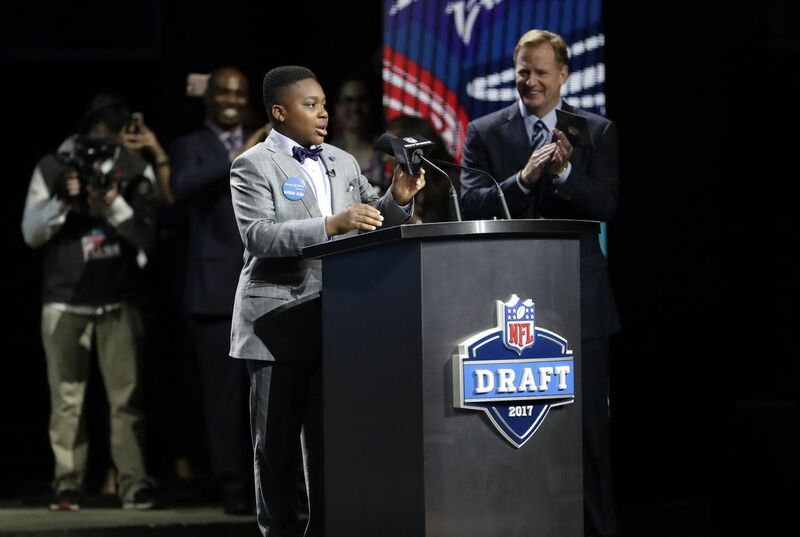 T.J. Owuanibe got his wish: The 14-year-old shared center stage with NFL Commissioner Roger Goodell to announce the Baltimore Ravens' top draft pick. And then the boy finally smiled. An instant after that, Goodell stepped aside and let Owuanibe move behind the microphone, which was too high. After Goodell made an adjustment to the microphone, Owuanibe pumped his fist and told football fans around the world who the Ravens picked at No. 16. Owuanibe loved the Ravens long before he was diagnosed with cancer. In recent years, the teenager met with the coaching staff and several players at training camp through another nonprofit organization, the Casey Cares Foundation. Thus, when his wish was presented to the Ravens front office, the team happily complied. Coach John Harbaugh informed T.J. that his wish has been granted. T.J. put on a straight face and was nervous during the show but when commissioner Roger Goodell said "He likes the Ravens" he laughed and smiled. T.J. was happy he had got to have his with and he was happy he got to meet seven of the players and the coaching staff at their training camp. Wow that was a big dream come true for TJ and that he finally got his wish of being a pick in the NFL draft and he also was in the 1st round. And I also agree that making a kids dream come true finally and I'm thinking that he was very happy that day.Another reason is that who ever knew that the NFL staff and directors r that nice to help a cancer suvivor finally achieve his dream. TJ is a hard fighter,and I know for sure, that's a memory TJ and his family will never forget. It is a good thing that he got his wish. He is very lucky to do what he did. It is good that there is foundations like this. So the kids that don't have as good of a chance as the rest of us, have a chance to follow their dreams. The context says that he loved the ravens football team and that his wish was to be part of the NFL draft. So when he did get to be a part of the draft then his wish came true so he was happy. When they said about how he just nervously stood there and when they said"he loves the ravens" he smiled so it kind of shows that he was nervous but yet kind of scared and happy all in one. I think that what the team did for T.J. was an amazing thing. I think they saw his wish and thought " We have a chance to do something amazing, I say we take it." and I think that the one thing that mattered to them was fulfilling T.J.'s wish. This story was heartbreaking. It was hard to read this and not be a little emotional. I also like this article because i am a very big sports fan. I'm glad that this kid who has been going through so much got to get his wish granted to meet the Ravens.